New Jersey's eagles: easier to find than you'd think. Point out a bald eagle to some avid birders, and there's a good chance they'll nonchalantly acknowledge your find and continue their search for something a bit harder to spot. The nation's avian symbol, once an extremely rare sight, has made a great comeback from a decline of just one nesting pair in the state 40 years ago, so it's not a big 'get' for most folks who are out in the field regularly. Like the osprey and peregrine falcon, the bald eagle is now marked as 'least concern' among conservationists internationally, but they're still on the state endangered list due to habitat loss and continued environmental contaminants. That means they're not an everyday sight, but the chances are pretty good that you'll find one if you're in the right place. Earlier this year I decided to keep track of how many bald eagles I'd see during our adventures around New Jersey. I wasn't particularly focused on going to specific places like hawk watches that draw migrating raptors. Rather, to paraphrase John Lennon, I wanted to see if 'eagles are what happens while you're busy doing other things.' If I could find a bunch without really trying, it might prompt you, our Hidden New Jersey readers, to look up once in a while to see what you can find. I was pretty optimistic about the project, but the results are a nice surprise. Unless an eagle lands in the tree outside my living room window this afternoon, I'll be closing the year at 20 in the state, and 29 overall. You may be thinking, "well, yeah, you always go to those special birding spots, so of course you find eagles," and you would be right... up to a point. We found a few in predictable places like Forsythe National Wildlife Refuge, where they make their homes and apparently raise their young. I may have counted the same ones a few times, but I was delighted to see one being chased by peregrines -- a sight that would have been all but unthinkable in New Jersey two decades ago. And of course there was our more recent visit, when I witnessed two in the sky with talons locked together in a pre-mating flight/dance. Then there was the "thr-eagle" day when we saw two perched near the Parkway before we even got to the Brig exit. Once we got to the refuge, a third adult gave us an extended view as he set down in one of the impoundment pools for a little fishing. You don't have to go to the big parks to see eagles, though. The really fun discoveries were in less predictable places, like the shores of the Rahway River within the new Hawk Rise Sanctuary in Linden. It was my first eagle sighting in Union County, and wonderful to witness in such a heavily industrialized part of the state. One of our readers later dropped me a line to thank me for posting the story, because she'd thought she was either crazy or hallucinating when she saw an eagle flying over Route 1 nearby. I have to admit I was a little surprised to see the bird where I did -- within several hundred feet of a ballfield -- given eagles' standard desire to stay out of range of human activity. Maybe this guy has become accustomed to our population density himself. Maybe he truly was a Union County bird. Along similar lines, I was delighted to run across an adult bald eagle gliding above Helmetta Pond, a remediated body of water behind the old snuff mill in Middlesex County. The nearby pine forest apparently provides good cover for nesting, and good eating isn't far away. And, of course, there's the granddaddy of all great restoration stories: the Meadowlands, home to a nesting pair for a couple of years now. Ivan and I were enjoying a sunset cruise with the good folks of Hackensack Riverkeeper when we passed two eagles -- one adult and one immature -- perched in a tree and no doubt scanning for dinner. It's the only place within sight of the New York skyline where a Giants fan/environmentalist rejoices in seeing eagles thrive (well, not Philadelphia Eagles, but you know what I mean). I'll probably keep another eagle count in 2013, with maybe another bird added for fun. Pileated woodpeckers are always fun to seek out, and easily identified by sound and field marks, even without binoculars. How about you? What's your bird of the year? As we're closing 2012, I've been thinking about the places we've gone this year and the discoveries we've yet to share. Our summertime visit to Bordentown, for example, yielded a ton of great locations and potential Hidden New Jersey stories. Some were relatively easy to get to the bottom of, while others stayed frustratingly obscure. The Bordentown Female College is one of the obscure ones. All that's left of it is a plaque and memorial fountain downtown, at the corner of Farnsworth Avenue and Crosswicks Street, a few blocks from Clara Barton's school. There's no other explanation or context nearby, nor is there a structure attached to it, so I had to do a little digging. Women-only education has an interesting history in America, with some of the earliest examples being "female seminaries" in the early and mid 1800s. Some focused on the type of higher education we're familiar with, while others were basically finishing schools that prepared young women from wealthy families for their entry in polite society. Literature and cultural arts may have been in the curriculum, but the primary purpose seems to have been turning out nice young ladies who were equipped to have a decent conversation at a dinner party. Bordentown Female College seems to have been more the latter than the former. Founded as a boarding school by Methodist minister Rev. John Brakely in 1850, it was advertised as "an excellent school, in a healthy and accessible locality, under wise administration and reasonable in its charges." An 1880 brochure outlined its purposes as "1st. To make thorough, practical students. 2d. To improve their manners, morals and health. 3d. To provide a pleasant home." Parents were also comforted by the fact that "The young ladies enjoy the personal supervision and maternal care of the wife of the President, whose modest and amiable qualities command the affection of all." The school was well-regarded among its peers, attracting a student body that drew largely from New York society. A July 1869 New York Times article on that year's commencement noted that "essays read by the young ladies evinced talent and culture, the music was artistic and all of the performances of the occasion were conducted in good taste..."
BFC's tenure was relatively short, as the school fell victim to the financial panic of 1893 and eventually closed altogether. One might also wonder if the gradual growth of nearby women's colleges like Bryn Mawr and its Seven Sisters counterparts might have drawn potential students away, as well. Either way, it appears that its alumnae regarded their Bordentown experience with fond memories, as their lovely 1914-era fountain still graces downtown. Not long after Hurricane Sandy, I wrote about damage at Ellis Island and the uncertain future of the unrestored Public Health Service immigrant hospital on the south side of the island. Since then, the National Park Service has done a great deal of work to mitigate much of the storm's impact both there and at Liberty Island, but much more needs to be done before the islands can be reopened to the public. their hinges by Sandy's powerful surges. 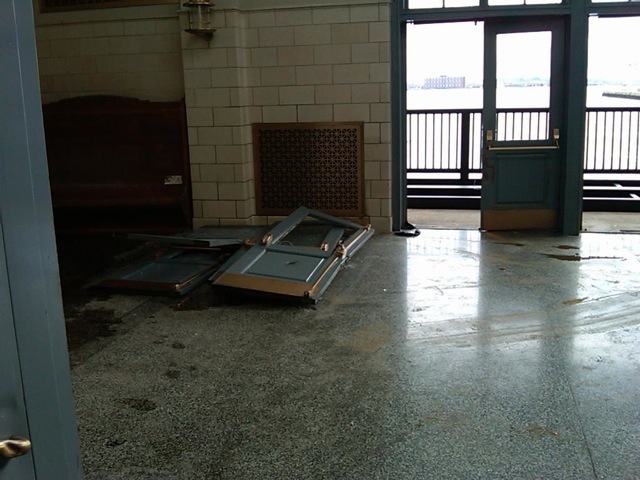 One thing I didn't mention in my earlier report was Sandy's less-visible impact on the continuing mission of Save Ellis Island, the National Park Service's official non-profit partner working to bring the south side buildings back to use. SEI's first large-scale project on the island was the restoration of the Ferry Building that once was the last stop for immigrants who'd passed inspection and were on their way to New York City. Reopened to visitors in 2007, the building houses an exhibit about the public health aspects of the immigrant experience, the island's hospital facility and staff. Lesser known to the public is the building's multipurpose space, which hosts SEI's professional development seminars for educators. Teachers learn more about the historic and current day immigration experience, as well as methods for bringing Ellis Island to life in their own classrooms. Participants also have the opportunity to tour the main museum and hospital buildings, experiences that help them provide a richer perspective to their students. In many cases, teachers even return with their classes for additional, age-appropriate lessons about various immigration issues. leaving unsalvageable equipment and learning materials. 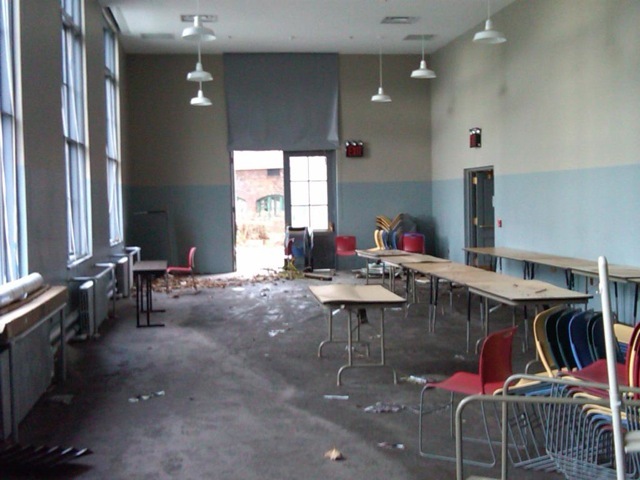 When the storm surges blew off the doors leading from the Ferry Building to the dock, they also took much of SEI's ability to keep its education programs running. Displays and artifacts were knocked over and soaked by the rush of water, and while they can be repaired and restored, they're now inaccessible to the public. Learning materials and historical photographs were ruined and will need to be replaced. And until the island reopens, SEI can't offer students and educators the full impact of its learning programs, which also fund a good portion of the long-range restoration effort. As a temporary measure, the organization is working to bring its seminars into classrooms in the New York/New Jersey area, so students will get at least partial benefit from learning about facets of Ellis Island. Still, SEI will take a financial hit from the situation, only broadening the harsh impact of the storm. Ellis has a lengthy history of ups and downs, from its heyday in the early 20th century to the abandonment in mid century and the restoration of the iconic main building in the 1980s. I have every faith that it'll come back stronger than ever, but right now, the fate of the south side is still very much in question. If you'd like to help Save Ellis Island stay the course and continue its work, visit their website to learn about various donation opportunities, as well as their educational offerings. Ellis Island is an irreplaceable part of the story of America, and its New Jersey connection - the hospital - must continue to be told. If you're doing any last minute holiday shopping in South Plainfield this weekend, stop and listen for the very faint sounds of old airplane engines. 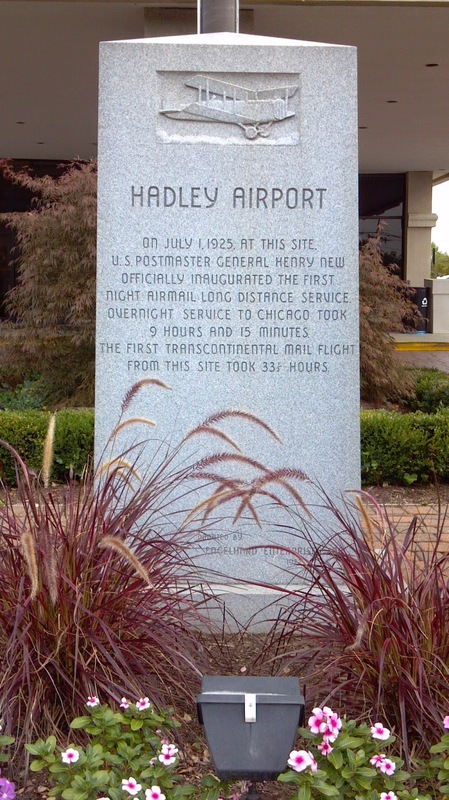 Today's Hadley Plaza is built atop aviation history: Hadley Field, the departure site of the first night airmail flight. Back in the early days of flight, government pilots hop-scotched around the United States relaying sacks of mail at speeds that often exceeded those of the usual train routes. Early attempts often ended in plane crashes and delays, but the 1920s saw the introduction of transcontinental airmail service. Before Lindbergh's historic New York to Paris flight, "coast to coast" routes were actually flown in segments, with takeoffs and landings in between to refuel or change planes. Even with delays we'd find unreasonable now, pilots were getting the mail to its destination far more quickly than people had experienced before. The New York area's air mail was handled on government flights through Long Island's Hazlehurst Airport, later known as Roosevelt Field. The island location, however, proved troublesome: the field was often fogged in, preventing safe take-offs and landings. A safer, more reliable location had to be found within the greater New York metropolitan area, especially if the Post Office were to start offering night service. John Hadley's South Plainfield farm proved to be an ideal location, with 77 acres of level ground just six miles from New Brunswick's train station. The Post Office leased the land from Hadley on November 1, 1924 and had the field cleared, runways built and radio towers completed by December 15. The following day, all daytime transcontinental mail flights were transferred from Hazlehurst, and James D. Hill successfully piloted the first "New York" to Chicago postal run from Hadley. New Jersey had earned its entry into airmail history. Preparations for overnight flights took a bit longer. With the addition of powerful floodlights and search beams to the field, Hadley was ready to strike another first. More than 15,000 people flocked to the field on July 1, 1925 to witness the departure of two airmail flights, one piloted by Hill and the other by Dean C. Smith, their first stops slated for Cleveland. Hill made it through without incident, but Smith had troubles from the start. Barely rising 100 feet on takeoff, his plane's engine seized, forcing him to turn back for repairs. Further engine troubles precipitated another emergency landing in Pennsylvania, and an apparent miscalculation in a new plane caused him to run out of gas and crash in a farm field just fifteen minutes outside of Cleveland. Smith survived all three mishaps, but you have to wonder about his luck, to say the least. Hadley Field's dominance was brief, as Newark Airport opened in 1928 and became the new East Coast airmail hub. Nonetheless, the small airport did valuable service as a Civil Air Patrol station during World War II and later as a test field for experimental planes and helicopters for the Bendix Corporation. Like many small airports today, Hadley also offered a flight school and aircraft rentals to local private pilots for recreational flying. Those private pilots may or may not have known that they were potentially sharing air space with nuclear missiles. In 1961, Hadley also became the site of one of the Nike batteries that encircled the New York area as the last defense against Soviet attack. Its nuclear-capable Hercules missiles were housed in two magazines staffed first by the Army and then by the New Jersey National Guard until the base closed sometime around 1970. I'm always curious why some small airports have stayed in business (i.e. Caldwell, Solberg) while others didn't survive. Take away the romance of flight and history, and the classic business reasons apply: investment and local sentiment. According to a 1967 aeronautical chart, Hadley's three runways were still turf, which would have prevented the field from attracting lucrative business from corporate jet operators. Other much-needed upgrades were cost-prohibitive and opposed by local residents, which pretty much sealed the deal. Hadley closed on November 1, 1968, 44 years after the Post Office originally leased the land. The valuable real estate was sold to a developer who built a shopping mall and office park on the site. I'm not entirely sure of the geography, but it's quite possible that you can buy a leather bomber jacket not far from where Dean Smith unceremoniously concluded his first attempt at nocturnal airmail delivery. Or maybe you can buy Air Jordans from a store built over the old Nike base. A stone memorial commemorates the first overnight mail flight, but that's about all that's left to indicate the airport was ever there. Post-trip research on one Hidden New Jersey topic sometimes raises questions about other matters. And it sometimes frustrates me - I find out about destinations I'd have liked to check out, had I known they were so close to another place we'd just visited. Indian Mills is one of those places. Nestled in Shamong Township not far from the Carranza Memorial, it was the site of New Jersey's only Native American reservation, established in 1758. The timing is key here, as it's during the French and Indian War, where, as the name would suggest, the natives sided with the French against the English settlers. Lenape tribesmen in New Jersey sued for peace, agreeing to give up their land rights provided that the legislature provided them a settlement area. The colony purchased 3,000 acres on the Mullica River for the tribe, and by the governor's decree, all natives in New Jersey were required to live within the borders of the reservation. Presbyterian minister John Brainerd joined the community, which he dubbed Brotherton for the brotherhood he hoped it would engender. Two mills and a house were on the tract when the natives arrived, and ten houses and a meetinghouse were later constructed with Brainerd's guidance. Eventually the community became known as Indian Mills, in recognition of the businesses the natives were striving to run there. Unfortunately, Brainerd became ill and had to leave the settlement, and prospects declined for the natives as the New Jersey government refused their requests for assistance. The reservation never became fully self sufficient, and most of the Lenape left to join the Oneida in upstate New York in 1802, after selling their Indian Mills property back to the state. Whether they did this of their own accord or were essentially forced to, well, that's a matter of whom you choose to believe, but it's been said that New Jersey is one of the few places where natives negotiated the terms of their departure rather than being subjected to violence by white settlers. This would be consistent with the Lenapes' reputation as skilled diplomats who often acted as mediators between warring tribes. A few Lenape stayed in the Pines, mostly assimilating with their white and African American neighbors. One in particular stands out for her longevity: Indian Ann. Depending on which sources you consult, Ann was born in 1804 or perhaps earlier, possibly to Tamar, the last chief of the local branch of the Lenape. She became known for her basket weaving talents and sold her creations throughout the region. Besides her status as one of the few left of her tribe in New Jersey, Ann was also known for her three marriages. Her second husband was significantly younger than she and died in service during the Civil War, leaving her with a generous eight dollar per month survivor's pension. According to legend, her third husband was over seven feet tall and tremendously strong. You wouldn't know it from its sedate downtown today, but Pitman was once such a popular summer destination that more than a dozen trains a day would bring visitors to enjoy the town's offerings. I discovered the primary reason for that on my recent Gloucester County jaunt, one day before the much-vaunted December 12, 2012. As it turned out, the number 12 was significant to my visit. You'll find the community of Pitman Grove just off Broadway, marked by a simple metal arch. Stroll down the walkway and you'll find yourself on First Avenue, one of the twelve sidewalks that radiates from the community's literal and spiritual hub, a trellised open-air church, or tabernacle. Each of these streets is meant to represent one of Jesus' disciples. On either side of each narrow pathway are tiny houses on 30x40 foot lots, many decked in Victorian gingerbread and happy pastel shades. By now you're probably sensing a religious theme, and you're spot on. Pitman Grove is a relic of the Camp Meeting movement that took hold in America following the Civil War. Protestants - in this case, Methodists - would unite in tent settlements for a few weeks in the summer to attend religious services and share fellowship in a rustic setting. Here in New Jersey, the most famous example is the still-in-operation Ocean Grove, though retreats were also established in National Park and other then-idyllic spots. A small group of ministers established this particular camp meeting in what was then Mantua, both for its peaceful rural location and convenient rail access. They named the community in honor of Reverend Charles Pitman, a prominent preacher of the time, and the name recognition probably didn't hurt attendance. More than 10,000 people were drawn to the grove for services, prompting the camp meeting association to purchase 70 acres of land and sell or rent small lots where the faithful could pitch their tents. Community members eventually started to build summer cottages on their lots, and a town grew up around them, with a store, restaurants, a barber, ice cream parlor and more. Pitman incorporated as a borough in 1905, and consistent with residents' religious values, the purchase of alcohol was forbidden in town. According to the borough website, "Pitman was known as a place with no mosquitoes, no malaria and no saloons. To this day, Pitman is a dry town with no liquor stores and no liquor licenses issued. We do, however, have our fair share of mosquitoes!" Some problems just can't be eliminated by statute. Like many other communities of its type, Pitman Grove eventually came on hard times, prompting the borough to take on about 50 of the properties in the 1970s when the Camp Association couldn't pay the taxes. Many of the homes weren't built for year round use, and some of the more decrepit ones were demolished while others were improved and rented out or auctioned off. The town also invested in upgraded infrastructure, clearly seeing the value in keeping the community viable. On my stroll, I noticed a sign on one house that announced it had been winterized, its utilities shut off maybe until next summer, so I suspect a few of the properties are still seasonal homes. I don't know if Grove residents are still predominantly worshipers, but I noticed several "Keep Christ in Christmas" signs in front of a few of the cottages. Services are still held at the restored tabernacle during the summer, so I guess the Grove is still a desirable location for the faithful, at least in the summer. Ever since we found the curious meridian markers in Flemington earlier this year, I've made it a point to visit a county seat if I'm nearby, just to see if the obelisks are still near the courthouse. I've only found them in Somerville and Mount Holly, but I'm hopeful for the rest. Even if I don't find them, the quest gives me reason to get to all 21 of New Jersey's county courthouses eventually. I made the trek to Woodbury the other day while I was in Gloucester County, and unfortunately I came up dry. The 1885 Romanesque courthouse replaced the original 1790s structure and may have also eaten up the space where the obelisks were stationed in the 1860s. The mystery continues! County seats usually have an interesting story or two lurking about; in older times, they were often the largest and wealthiest communities in their respective areas. While some of them are a bit down on the heels these days, there's always a sign of past glories to be found. Woodbury didn't disappoint. Along with some lovely looking older homes and commercial buildings, I came across what looks like a massive rebuilding effort behind the facade of the G.G. Green Block building downtown. What I didn't know was that the structure was essentially built on patent medicine, and it's a symbol of the city's prosperity in the late 19th and early 20th century. Born in nearby Clarksboro, George Gill Green left the University of Pennsylvania medical school in 1864 to fight in the Civil War with the 142nd Illinois Regiment. Following the war, he used his medical training to start three medicine companies - first in Baltimore and then in Ohio. He returned to New Jersey in 1872 with his young family, but rather than starting fresh, he bought the rights to manufacture and market two patent medicines his father had been making and distributing. The business grew thanks to aggressive advertising, and Green became Woodbury's first multimillionaire as the city grew in prominence within the medicine industry. Using some of his wealth, Green built a substantial building on Broad Street, in the city's business district. The G.G. Green Block reportedly held an opera house and an upstairs ballroom, an arrangement that was repeated in several prosperous towns around New Jersey. A few years later, he purchased a hotel in Pasadena, California, which was then a popular recuperation resort for tuberculosis patients. Renaming the property Hotel Green, he later built an addition called Castle Green for extended stay guests. Green's patent medicine empire dwindled with the passage of the federal Food and Drug Act in 1906, which required that manufacturers had to be truthful in their advertising claims. Perhaps his products made users feel better, it was more likely that they were affected by the laudanum (or as it's known now, tincture of opium) in them than by any ingredient that actually cured what ailed them. The opera house within the G.G. Green Block was eventually converted to a movie house, the Rialto, and other parts of the building were used for a variety of purposes until the building was shut down in 2002. Placed on the National Register of Historic Places in 2001, the building's future was in doubt as it continued to deteriorate and one development plan after another stalled. The final blow appeared to be the 2011 Virginia earthquake, believe it or not; parts of the facade crumbled to the sidewalk, bringing the building's structural integrity into question. In an interesting turn of events, a real estate developer experienced in historic properties purchased the Green building earlier this year. They plan to convert the building for combined retail and residential use while restoring the exterior, and historic preservation organizations are optimistic about the outcome. It may not revert back to its opera house past, but it appears that the G.G. Green block will regain its status as one of the grandest facades in town. And who knows? Maybe there will be a drug store at street level. Paterson is known as Silk City for good reason: at one point, two-thirds of the nation's silk output came from the city's 175 silk mills, which employed over 20,000 people. The giant scissors of Paterson have absolutely nothing to do with that. Well, except that they're now displayed in the Passaic County Museum at Lambert Castle, the former home of silk magnate Catholina Lambert. Ivan and I found them not long after we discovered the world's largest spoon collection. The story goes like this: like many employees, teachers in Paterson's school system wanted to know when the 'big boss' might come by to check on their work. Given that they were assigned to their particular rooms, it wasn't easy for them to communicate when classes were in session. Children would go unsupervised if one teacher went to tell another that the superintendent of schools was in the building, and that certainly wouldn't reflect well on them if the principal (or, God forbid, the superintendent) happened to notice. Thus, they had to find a way of getting the message around quickly. AND they had to do it in a way that didn't sound like "Act busy... the boss is coming!" A brilliant teacher came up with the perfect idea. You probably had a teacher or two who'd always be borrowing things from his or her colleagues, using students as the messengers. I can remember being sent to the next classroom to ask the teacher if he had some extra oaktag because Mrs. So-and-so had come up one sheet short for the class project. It happened often enough (more with some teachers than with others) that seeing a kid go from one classroom to the next was unremarkable and wouldn't be questioned. Of course, you couldn't send a student to the next classroom to tell the teacher that Superintendent Wilson was in the building, but you also didn't want to send her with a request for something the teacher might have had available. The requested item had to be unusual enough to warrant asking a few teachers, but not so odd that it would raise suspicion. It's apparently not known who came upon them as the perfect request, but the teachers agreed that if one of them saw the superintendent in the building, she'd send a student to the next room for the big scissors. That next teacher would say she didn't have them and send the child on to another teacher in the 'hopes' he'd have them on hand. In this very innocent way, the whole faculty would be alerted, and the principal and students would be none the wiser. We also don't know if Superintendent John Wilson ever got word of the big, constantly-missing scissors during his visits, but they made a special appearance at his retirement dinner in 1944. Teachers presented him with a large wooden pair of shears and let him in on the secret. 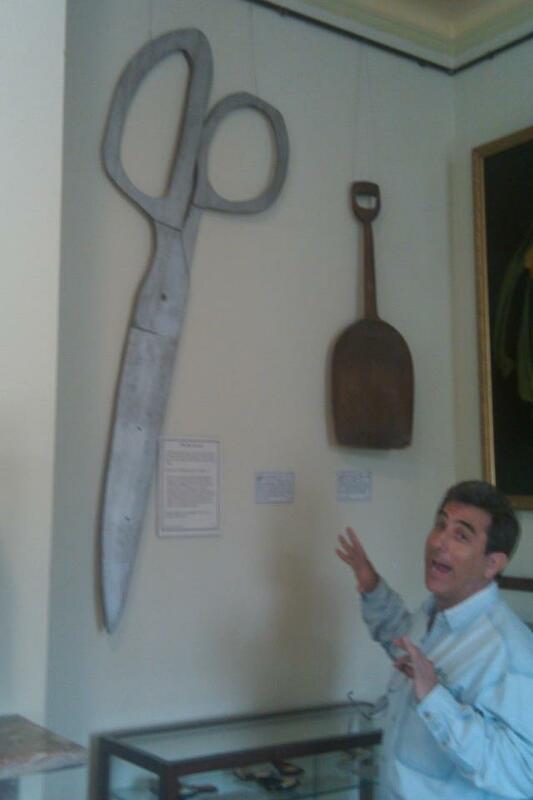 He must have been amused by the gag; he kept the prop and later donated it to the Passaic County Historical Society as an example of life in Paterson's school system. Every once in a while, we run into a place or a story that is so remarkable that we wonder why in heck we'd never heard it. Our visit to the Princeton Battlefield revealed the contributions of a Revolutionary War officer who was so tough that, well, he could teach nails how to be tough. His grit and heroism made such an impression on his contemporaries that a county, a fort and a tree in New Jersey were named in his honor though he never lived here. Add to that the fact that he sired a family that produced, among others, General George Patton, and it's odd to think that more of us don't know his story well. 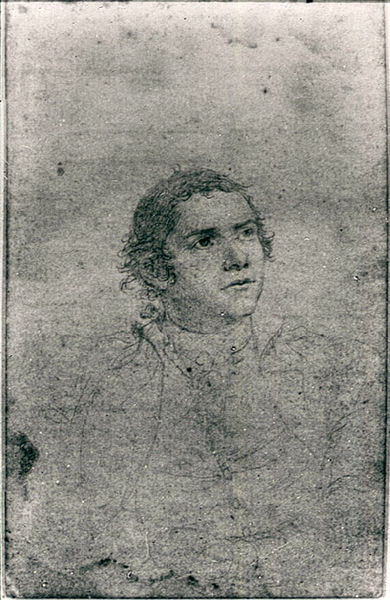 Originally trained as a physician, Hugh Mercer first saw combat in his native Scotland as an assistant surgeon in the army of Bonnie Prince Charles during the battle to regain the Scottish monarchy. Fleeing to America to escape persecution, he settled in Pennsylvania and practiced medicine, but the call of battle came once again, this time the French and Indian War. He joined the British cause in 1755, first as a surgeon and then as a soldier, serving honorably in both roles. It's said that after suffering serious injury and being separated from his troops in a battle against the Delaware and Shawnee tribes, he walked 100 miles back to his fort. His feats earned him the rank of colonel and some influential new friends, most notably George Washington. Fast forward to the American Revolution. Mercer was first appointed Colonel within the Virginia Line and then Brigadier General of the Armies of the United Colonies. In the latter role, he supervised the construction of Fort Lee on the Palisades, and his brigade was among the troops who retreated in November 1776 following the British attack on the fort. You'll recall that after the Continentals' arrival in Pennsylvania, Washington set into motion the surprise attack that would startle the Hessians at Trenton and turn the tide of the war in the Americans' favor. The success at Trenton emboldened Washington to attempt to take Princeton on January 3, 1777, with Mercer's brigade at the lead. Hitting the British head on at Thomas Clarke's farm outside of town, Mercer found himself separated from his troops as he had during the French and Indian War. This time, however, the outcome was not to be as favorable for him. Having shot his horse from under him and confused him for Washington, the British surrounded Mercer and demanded that he surrender. Instead, he drew his sword and charged, despite being substantially outnumbered. The Brits set on him with musket butts and bayonets, beating him severely and stabbing him seven times before leaving him for dead. They clearly underestimated the amount of fight left in the man: he endured another nine days before perishing. While Mercer himself was unsuccessful in repelling the British, his courage ultimately helped turn the tide in the Americans' favor. Washington rallied Mercer's retreating troops to return to the conflict, resulting in another decisive battle that lifted American morale and forced Cornwallis back to New York. Not long afterward, Fort Mercer, on the Delaware River, was named for him. So, now we know about the general, but what's this about a tree? 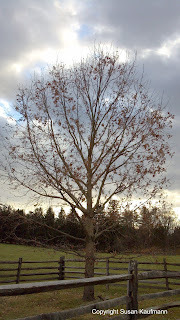 Legend holds that the mortally injured Mercer was propped beneath a white oak tree on the Princeton battlefield, and that he refused to leave his troops until they had won the battle. In truth, he was brought to the nearby Clarke House for treatment as soon as he could be retrieved, but you have to admit that the tree story is a lot more compelling. 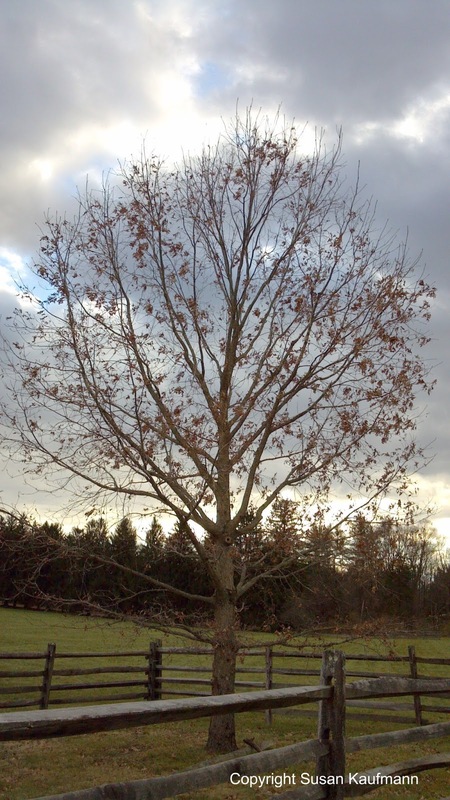 A reminder of the general's heroism, the oak became the symbol of Mercer County and Princeton Township, as well as New Jersey's Green Acres program. (So much for the Salem Oak.) Unfortunately the tree succumbed to old age and collapsed in 2000, but a healthy successor tree, sprouted from an acorn of the original in 1980, now stands next to the stump of the trunk against which Mercer was said to have leaned. Let's hope that this descendant lasts many years, to help tell the story its parent is said to have witnessed. If you have interest in historic preservation, you're likely familiar with the many protracted fights to keep development from encroaching on some of America's most important battlefields. The past 40 years or so have seen attempts to build a Disney theme park on the Civil War-era Manassas battlefield in Virginia (also known as the "Third Battle of Manassas"), and here in New Jersey, the encroachment of residential sprawl on portions of the historic site of the Battle of Monmouth. It goes without saying that your Hidden New Jersey explorers are firmly on the side of preserving historic battle sites. Keeping battlefields undeveloped is crucial to helping visitors understand the the challenges our forebears faced in liberating and defending our nation. Somehow, watching a reenactment on a developed battlefield -- as I did for the 225th anniversary of the Battle of Springfield -- loses its impact when you see Hessians marching past a CVS. Thing is, we've been building on battlefields for as long as there's been a United States. Many of the battles took place on privately owned land, and when the wars were over, the owners were more concerned with making their land profitable than they were in preserving history. You really couldn't blame them, especially farmers who were trying to get as much from their acreage as possible. I hadn't given too much thought to the old development issues until we stopped by the Princeton Battlefield a few weekends ago. A key location in the ten crucial days that turned the tide of the Revolution in the Americans' favor, the Battlefield State Park includes the site of the recently-deceased Mercer Oak, under which General Hugh Mercer was said to have collapsed after having been bayonetted by Redcoats several times. The Clarke House, which was used as a hospital during and after the battle, is also still on site. And then there's the Colonnade -- a set of Ionic columns topped by a large lintel and supported by brick walls on the sides. It sits on the northern side of the park, atop a hill far opposite the Clarke House, looking very out of place and incomplete. There's no statue of Mercer or Washington or anyone else beside it to give it context, and the casual passer-by is left to wonder what in heck it is. If it were in Greece or Italy, you'd shrug it off as just another classical ruin, but in Princeton? Ivan and I took a walk up the hill to check it out (and, well, to see if we could find winter finches, but that's another story). 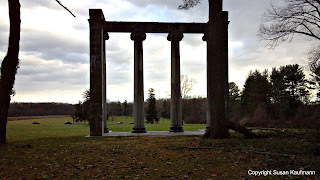 Long story short, the Colonnade is a ruin -- of not one, but two houses. Originally, it served as part of the facade for a Philadelphia mansion designed by U.S. Capitol architect Thomas U. Walter in 1836 for a merchant named Matthew Newkirk. 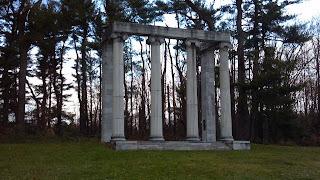 After the Newkirk home was demolished in 1900, the columns were brought to Princeton and recycled for the entrance of Mercer Manor, a grand home built at the edge of the battlefield. Mercer Manor stood on the site for over 50 years, until it was severely damaged in a fire. Mostly unsalvageable, the mansion was demolished in 1957, except for the Colonnade that stands today. Its then owners, the Institute for Advanced Study, donated the property to the State for inclusion in the Battlefield Park. A view of the battlefield from behind the Colonnade. 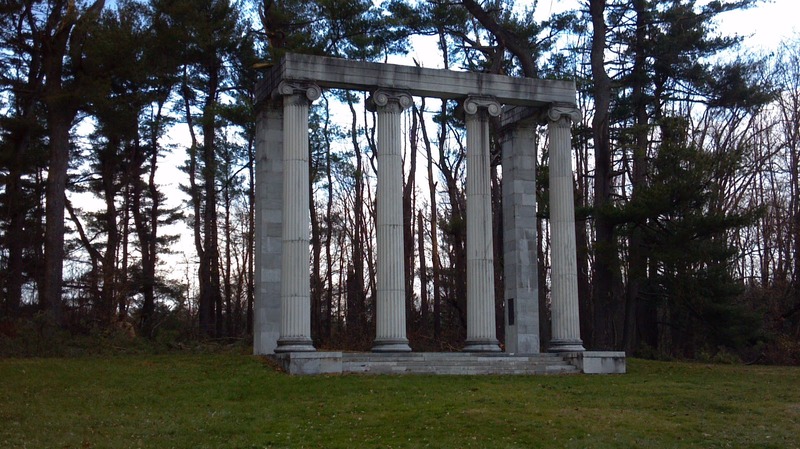 Since then, the four Ionic columns have become the focal point of a memorial to unidentified soldiers killed in the battle -- 21 British and 15 Americans who are buried somewhere behind the site where Mercer Manor once stood. Nearby, there's a plaque on which is printed a memorial poem written in 1916 by visiting Princeton professor and future Poet Laureate of England, Alfred Noyes. Unintended as it might have been, the Colonnade could be considered a fitting tribute to the brave Americans who fought at Princeton. These patriots were battling for a new republic and victory that until then appeared unlikely. Their humble contributions helped forge a country that has stood strong for well over two centuries. Our salute to Carranza completed, we found our way northward to Tabernacle and then eastward toward Chatsworth. The small town center is known to locals and a small group of Jerseyphiles as the capital of the Pinelands, but a hundred years or more ago, it was the preferred home of royalty. Royalty? In the Pines? Absolutely, and specifically on Chatsworth Lake, near County Route 532. Burlington County is no stranger to titled residents -- consider exiled Spanish King Joseph Bonaparte, who established his Point Breeze estate in Bordentown. With all due respect, though, the remote Pinelands doesn't seem to be much of a place for a monarch to settle. Why, of all the places in the world, would an aristocrat choose Chatsworth? As many New Jersey transplants have experienced, family has a lot to do with it. A New York real estate baron named Joseph D. Beers had bought a substantial amount of land in the Pinelands in the early and 19th century, perhaps on speculation, given the success of the region's glass and iron industries. Once those businesses declined, however, Beers' family was left with about 25,000 acres of land in what was then called Shamong. In the late 1800s, one of Beers' granddaughters, Palma de Tallyrand Perigold, married Italian Prince Mario Ruspoli, who was then serving his country as an attache in Washington, D.C. Palma had inherited 7000 acres of Beers' land, and with her husband built a Queen Anne style home fashioned after the Chatsworth estate in England. Given their stature in New York and Washington society, they entertained widely, attracting a veritable who's who of late 19th century and early 20th century elites. As the story goes, Ruspoli and a partner developed the Chatsworth Club, a country club for their well-to-do friends and associates. Located on the lake visible from Route 532, the club grew to over 700 members, including Astors, Vanderbilts, Biddles, Drexels and even J.P. Morgan. The Jersey Central Railroad's Blue Comet ran through Chatsworth on the way to Atlantic City, delivering the famed and wealthy to the club in style from New York. Just by happenstance, I found a trace of the story in Henry Charlton Beck's classic Forgotten Towns of Southern New Jersey. As he tells it, the club was founded by a coterie of New York capitalists including Levi Morton, who was vice president of the United States under Benjamin Harrison. It's supposed that Morton and his fellow power-brokers wanted a place where they could enjoy hunting, fishing and socializing with whomever they chose, without worrying about inquisitive newspaper reporters. Beck also opines that the Ruspoli/Perigold home served as the Chatsworth Club's main building and conveniently burned to the ground as the club itself was failing financially. Regardless of which is true -- the Chatsworth community's own account or Beck's tale -- the Club is no more. Today, the only vestige of the venture is the 1860's era White Horse Inn, which once served as a stopping point in town for visitors to the club. A local group called the Chatsworth Club II is working to restore the Inn as a museum, using proceeds from the annual Cranberry Festival to fund their work. When Ivan and I stopped in town, the building looked good indeed. It seems they're well on their way.